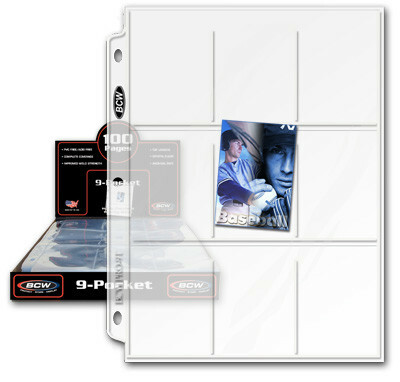 The BCW Pro 9-Pocket page is an acid free archival quality product that is designed for the safe long- term protection of your valuable collectible trading cards. This product features high clarity polypropylene and a top loading pocket with strong welds. BCW Pro 9-Pocket pages fit all standard 3-ring binders and albums.Use the 9 pocket page to protect store and display collectible trading cards like: sports cards Magic the Gathering Pokemon Yugioh Dragonball Z and others.